Science and technology are awesome. Don’t believe me? You’re on the wrong site, partner. But check out this: a video of the world’s most advanced prosthetic limb. 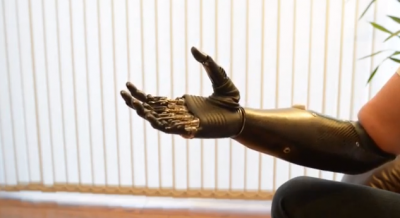 Nigel Ackland shows off his recent lower-arm replacement that is quite frankly, one of the coolest things I’ve seen in a long while, and shows how far we’ve come with prosthetic limbs. It’s so precise he can type, pour a bottle with ease, or even peel vegetables. And it reminds me of Adam Jensen’s robot arm from Deus Ex: Human Revolution in its simple, elegant design and dark coloring. Now the only thing is it needs to be able to spin around completely, throwing attackers off balance. Ok, ok, I jest. But that “come hither” hand motion made me chuckle.